April 19, 2013, 3:18 p.m. 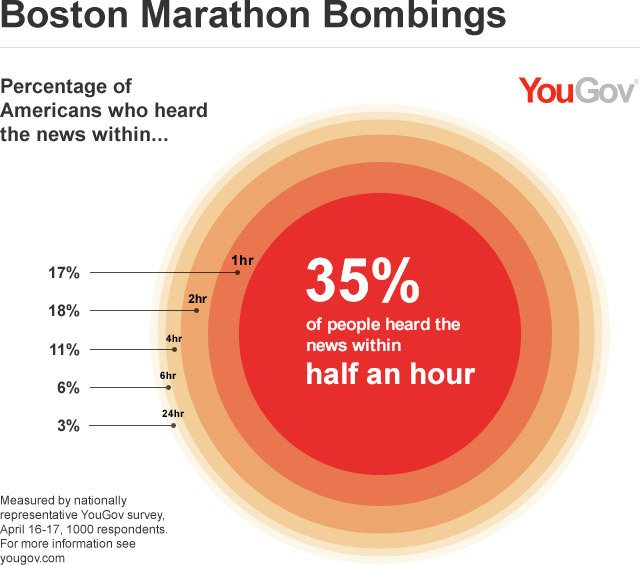 While details are still emerging about the bombing at the Boston Marathon on Monday, new research from YouGov US shows that word of the incident spread incredibly fast. 35% of Americans reported having heard about the bombing within half an hour, while 87% report having heard about them within six hours. Futhermore, 12% of Americans reported knowing someone in Boston at the time of the explosions who they were concerned about. Among those who knew people in Boston, the most popular method to make sure friends and family were okay included Facebook (cited by 39%), phone call (30%) and text message (26%).